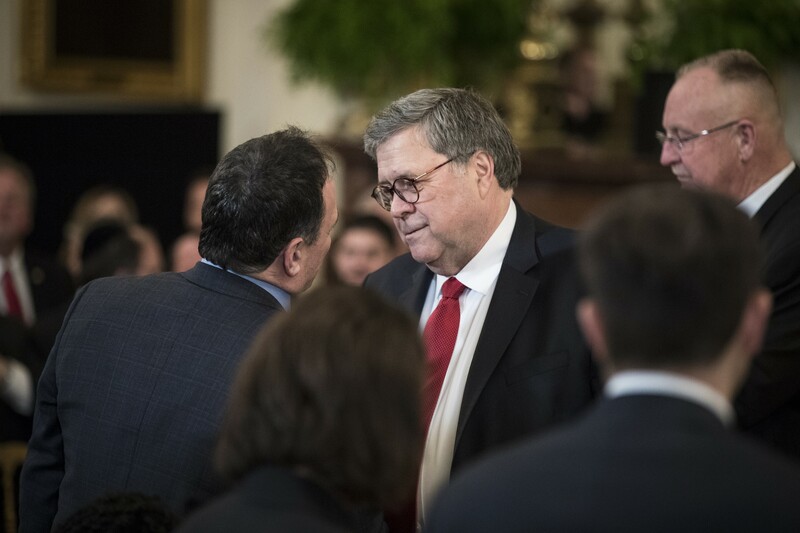 Attorney General William Barr at the “First Step Act Celebration” at the White House in Washington, April 1, 2019. Barr will release a redacted version of the special counsel’s report on April 18, a Justice Department spokeswoman said on April 15, the first step in what promises to be a protracted fight with Democratic lawmakers over how much of the document they are allowed to see. WASHINGTON — Attorney General William Barr will release a redacted version of the special counsel’s report Thursday morning, a Justice Department spokeswoman said on Monday, the first step in what promises to be a protracted fight with Democratic lawmakers over how much of the document they are allowed to see. Barr will send the report after lawyers from the Justice Department and the office of the special counsel, Robert Mueller, finish blacking out secret grand jury testimony, classified information, material related to continuing investigations and other sensitive information. Barr, who was sworn in as attorney general in February, said in a letter to congressional judiciary committee leaders last month that the report “sets forth the special counsel’s findings, his analysis and the reasons for his conclusions” in his inquiry into possible links between the Trump campaign and Russia’s election interference and whether President Donald Trump illegally obstructed the investigation. “Everyone will soon be able to read it on their own,” Barr said of the report. Barr and Rod J. Rosenstein, the deputy attorney general, set off a firestorm when they concluded that Trump had not committed “an obstruction-of-justice offense” in lieu of a determination from Mueller himself. Some prosecutors who worked for Mueller have said Barr did not accurately represent their findings after he received the report and shared its main conclusions last month. Under the special counsel rules, the attorney general can decide whether to share the report with the public and how much of it to release. But Democrats have shown an unwillingness to rely on Barr’s judgments. The House Judiciary Committee voted to authorize its chairman, Rep. Jerrold Nadler, D-N.Y., to subpoena Barr to compel him to turn over an unredacted copy of the special counsel’s report as well as its underlying investigative files. “As I have made clear, Congress requires the full and complete special counsel report, without redactions, as well as access to the underlying evidence,” Nadler said in a statement this month.